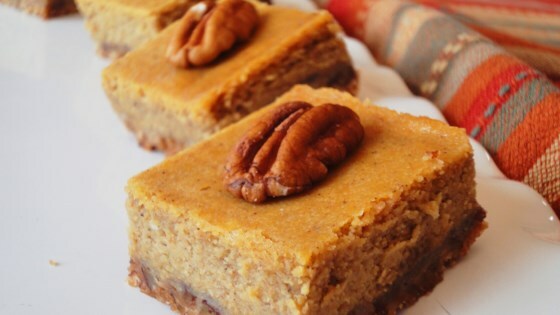 "These pumpkin cheesecake bars are delicious and perfect for the fall holidays. They taste best when chilled in the refrigerator overnight!" Stir flour, butter, and 1/4 cup sugar together in a bowl until dough is well-blended. Pat dough into the bottom of a 9x13-inch baking dish. Bake in the preheated oven until crust is lightly golden, 10 to 15 minutes. Cool. Reduce oven temperature to 350 degrees F (175 degrees C). Beat cream cheese, 1/4 cup sugar, 1 egg, and vanilla together in a bowl with an electric mixer until smooth. Whisk pumpkin puree, evaporated milk, 3/4 cup sugar, 2 eggs, cinnamon, salt, ginger, and cloves together in a bowl. Spread cream cheese mixture evenly over cooled crust. Pour pumpkin mixture over cream cheese mixture. Bake in the preheated oven until bars are set, about 60 minutes. Cool to room temperature, then refrigerate overnight. Amazing pumpkin cheesecake bars that are perfect during the Fall season. My husband loves pumpkin pie and I love cheesecake. Together the best of 2 worlds. I did make a graham cracker crust which I prefer. Easy & a big hit. I added 1/2 c chopped pecans to the crust, glad I did. Will make again! Easier than pie. Absolutely delicious! My wife and I added a bit less sugar and it was just right. Shared some with our neighbor and they loved it. A very nice treat.